For Sale: 2 year old boy. Chunky. Cuddly. Excels in the art of destruction. In search of: A cliff. Preferably high off the ground, with large jagged rocks reaching out for me with their arm-like spikes, waiting patiently to bring me in for a warm hug at the bottom. I’m dramatic and kiddingbutnotreally. It’s just been one of those days, guys. First, well, just look. 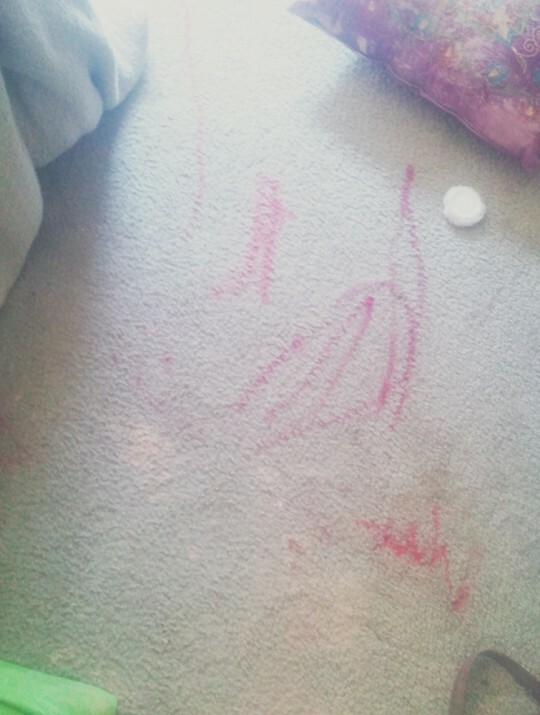 Those would be greasy, hot pink, chunky toddler handprints. Jack demolished some more of my beloved lipstick. Not only is it in the bathroom, but it also trickles down the hall and into our bedroom where it explodes into a something truly grand. Apparently, ladies and gentlemen, WE HAVE AN ARTIST. Hey, Sir Artist. Would you mind explaining your work to your fans? No? Oh, don’t be so humble! Really, WE ARE ALL ACHING TO UNDERSTAND. Anyway, jolly good show. Can you imagine going to gather your children for your favorite time of the day — NAPS! MOM’S ONLY ALONE TIME EVER IN HER LIFE! — only to find that mess in your room? Then you have to give your children baths (yes, “children”, because, don’t think for one minute that Maddie wasn’t drawn like a moth to that hot-pink flame), where they will proceed to dump three gallons of dirty bathwater all over the floor. Sir Artist is now asleep, probably dreaming up some inspiration for his next masterpiece. His understudy is supposed to be in her room, but has crept out quietly and is now hiding around the corner and peeking at me with one eye as I type this. And she’s not wearing pants. ← Mom guilt? Ain’t nobody got time for that. Ohhhhh…what a delightful little stink pot! I’m dealing with a sickling and my washing machine may have died. Eff this day! We are having a similar day here – I need to leave SOON for the sale of my sanity. Plus we’ve been cooped up; I hate winter. I’ll take hot pink lipstick over poop any day. My artiste was a poo-painter. I’m sorry, your post made me laugh so hard! I totally can relate, that’s all. I have a 2 1/2 year and 6 month old (boys). And I’m a SAHM. But I thank you for sharing this! I’m glad I’m not alone, ha ha!!! Oh my!! We had a similar experience with our son. 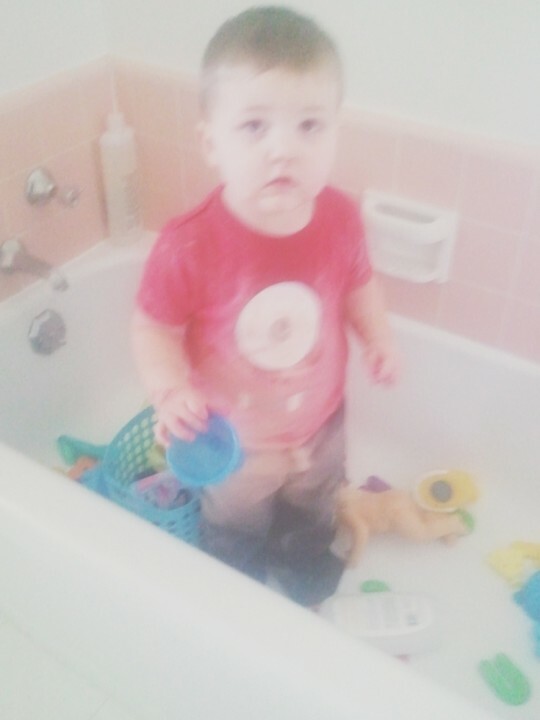 He got ahold of Vaseline! It was all over our carpet and bedspread. Needless to say I got a new bedspread out of it, still waiting for the new carpet (ugh). It’s hard to stay mad at them, just look at his adorable face!! oh sweet girl. i feel your pain. really. today was one of those days with twain too and for the first time in his career he was sent to bed 1.5 hours early. this day must end. really. This makes me look SO forward to my kid hitting that age where he can get into everything and cause ridiculous amounts of destruction. 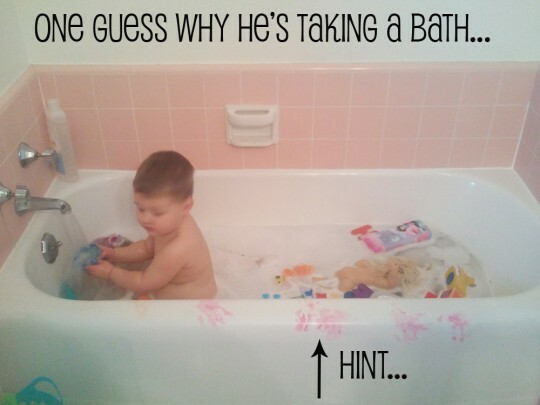 My two year old artist works with poop, soooo…. hands up if you want to trade. Anybody? No takers? Fine, I’ll go sob in the corner then. Do you do the instagrams? I do the instagrams by the username lorchick. I imagine it would be entertaining to bemoan artists together. Oh, I’ve so been there. My two were horrible about doing that kind of thing, especially our oldest directly after we moved. She was one angry two-year-old, and it was as much a means of protest as artistic expression for her. Naps-they simultaneously being joy and terror at the same time once the kids hit toddlerhood. I just got done changing the sheets on my bed (not an easy job due to the placement of the bed and a cradle beside it). Less than 10 minutes later, my 5 year old threw up. In my bed. It’s late, I’m tired, and we share a washer with the lady who lives in the upstairs of the house, so until tomorrow, I’m hiding the puke with a large bathtowel. Thank goodness it’s on Hubby’s side of the bed and he’s at work tonight. ha ha!!! Oh man, I DON’T miss those days! Kids gulping down bottles of dish washing liquid and having to race to the emergency room while your child burps bubbles, or using your favorite eye liner as a pencil crayon….